Jim Gilmore's Friday visit to Staunton ... a great success! So said the sandwich board on the sidewalk in front of Shenandoah Pizza on Beverley Street in historic downtown Staunton. An overflow crowd packed the gourmet pizza restaurant Friday afternoon to hear from Jim Gilmore who is running for the U.S. Senate, and to munch on complimentary pizza from the owners. He addressed the crowd and answered questions for the better part of an hour, then greeted everyone in the restaurant before heading out the door to visit other shops. Gov. Gilmore crossed the street to visit the Pampered Palate on Beverley Street, speaking to customers and even popping his head in the kitchen to say hello to the kitchen and wait staff. Next he went to Zelma's Vintage Clothing, Grandma's Bait, Seventeen East Beverley Antiques, and greeted folks up and down Beverley Street including a number of Mary Baldwin College students. Bob Stuart with the Waynesboro News Virginian, Mindi from the Staunton News Leader, and Ken Slack from NBC-29 provided local news coverage. It was great to have our Republican senatorial candidate in the area so close to election day. Thanks to Staunton Republican Alex Davis for making the arrangements on short notice. We finally had our first trick-or-treaters, later than in the past ... a pirate and a devil, about 7 and 9 years old. They were polite little fellas, both saying thank you as they received treats. The kids are late this year. We usually have our first little ones around 6:30. We will see what the rest of the night brings. SWAC Daughter is here to help hand out candy and see the kids before heading out later to her own party with friends. By the time she leaves, however, we are usually finished with the door-to-door goblins. The sweet kids up the street stopped by ... a three-year-old ballerina, an eight-year-old fairy, a 10-year-old ballerina, and their nine-year-old brother who was a geologist. Polite kids ... and got to visit with their mom before they headed on up the street. They all said thank you ... treats for all! Two more from the neighborhood ... a seven-year-old pirate and a 10-year-old wizard. Neat costumes, polite kids who were with their grandmother who is our neighbor. She loved the wisteria across the porch with the tiny twinkly white lights ... said she had tried to grow some but had not been successful ... so we gave her several seed pods so she can try again. The kids thanked us as they headed out into the dark to continue their rounds. 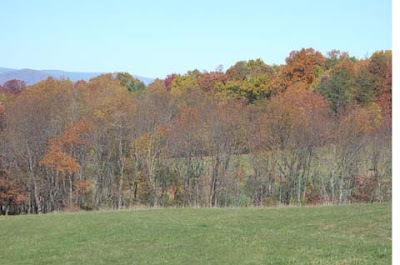 There is still plenty of color in the Valley. 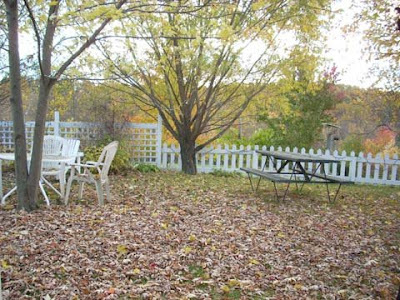 Some trees are bare of leaves, some are turning brown, but others are still bright reds and yellows ... and some are just beginning to turn. 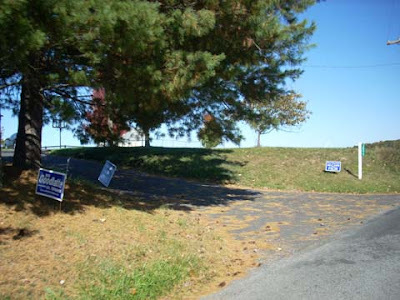 I snapped photos today as I was out lit-dropping, delivering signs, and doing other campaign work in these final days before the election. 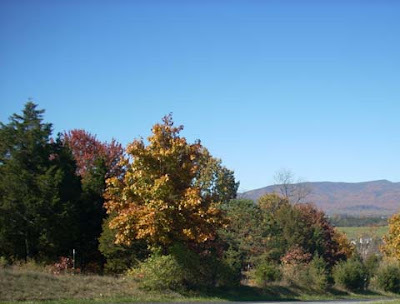 Every bend, every hill, every curve in the road offered another breath-taking vista of the beautiful Blue Ridge and Alleghany Mountains. 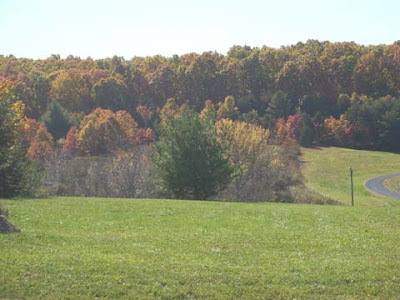 My husband's sister will be in from out-of-town for the rest of the weekend to enjoy the mountains in these waning days of leaf color. 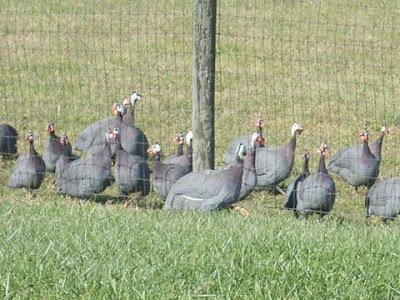 It was the invasion of the wild guineas in Tater's field today as she rounded up the herd of 20 fowl, feeling it was her responsibility to keep them in that corner. 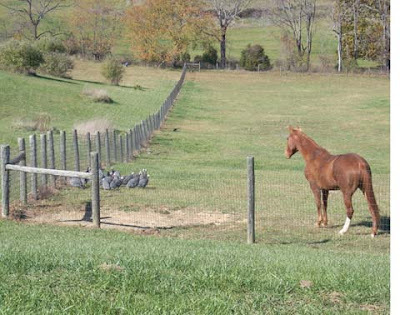 It was hilarious ... 19 birds had somehow found themselves inside the pasture fence and could not get out ... and one was outside and could not find his way in. No matter what they did, Tater herded them back into the corner and kept an eye on them. 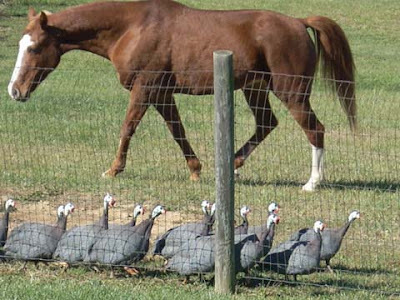 When I left, she was still guarding those guineas. She now has the title "herd horse"! 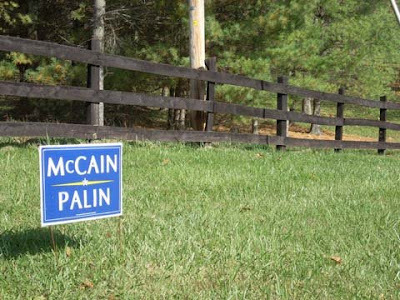 The Palin family are on the campaign trail today ... but that hasn't stopped them from dressing up for Halloween. Seven-year-old Piper spilled the beans to the Fox News folks and, sure enough, when the family showed up for a live appearance in Pennsylvania, it was evident today was Halloween. Piper was a snow princess ... six-month-old Trig was an elephant ... Sarah was dressed as Tina Fey! 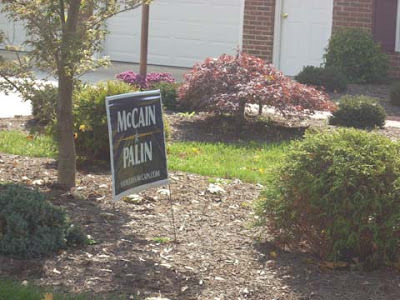 They may be campaigning ... but the Palin family didn't forget the fun of Halloween for their children. Mike Ditka for Sarah Palin! 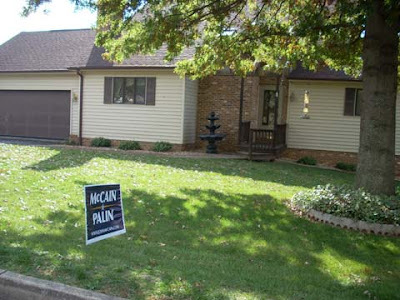 Appearing live this morning in Pennsylvania ... Sarah Palin and her family. What an honor ... introduced by Coach Mike Ditka who supports John McCain and Sarah Palin. Sweet! What political figure would you dress up as this Halloween? It has been fun to hear people talk about who they would dress up as this Halloween if they had to choose a political figure. Who would you dress up as? 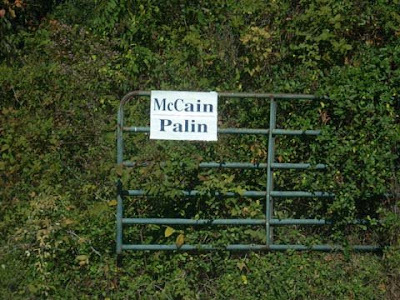 Sarah Palin seems to be a hot item this year and the presidential candidates. What about you? Jim Gilmore, Republican candidate for U.S. Senate, will be in Staunton Friday afternoon, October 31, at 2:00 p.m. at Shenandoah Pizza in historic downtown. Come on out and talk with the Governor about his issues and you will be convinced he is the best candidate to protect this country and serve our state. IT'S VICTORY TIME FOR JIM GILMORE!! He is black, he is young, he is a Christian, he is conservative, and he is Republican.He supports John McCain and Sarah Palin ... and he tells it like it is to other young blacks. He has done it again ... watch Zo's video on health care, energy, taxes, pretty much everything. "It's not over until the last vote is counted." "Re-elect him!" 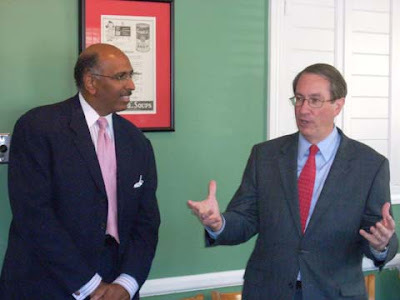 Michael Steel said of Bob Goodlatte. 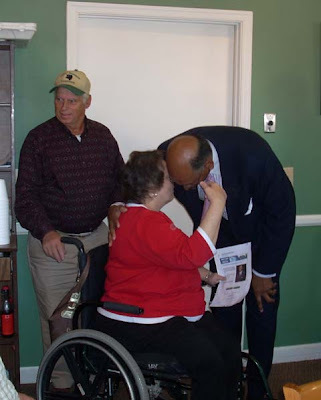 Peggy Huffman talks with Michael Steele. 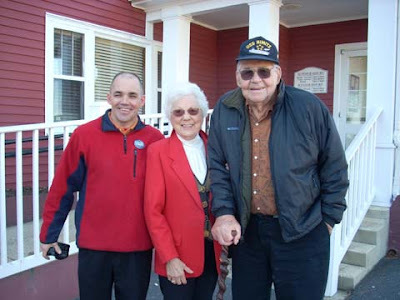 "JarDog," our resident Marine, with Mr. and Mrs. Frost. 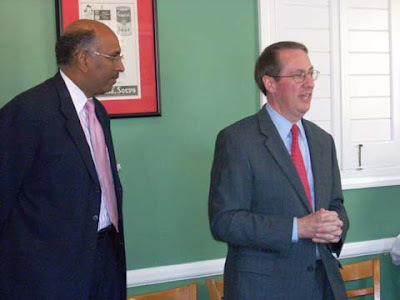 Bob Goodlatte introduced Michael Steele. 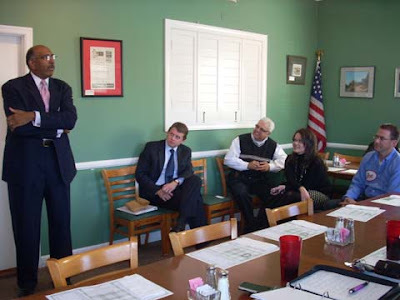 A group of SWAC area Republicans met at Rowe's Restaurant Thursday afternoon to welcome Maryland's former Lt. 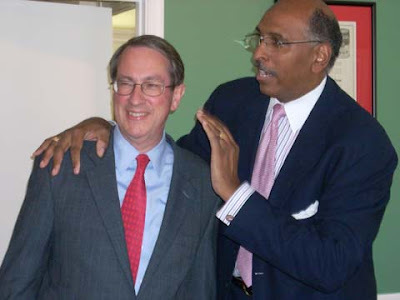 Governor Michael Steele as he stumped for John McCain's presidency. He was introduced by Congressman Bob Goodlatte who had to leave for another appearance in Buena Vista. Mr. Steele relayed a story of the summer of 2007 when he saw John McCain sitting in the airport with his luggage waiting to catch a plane to another campaign stop. He had laid off half his campaign staff and was almost out of money but when asked how things were going he replied, "Great!" That optimism carried him through to win the GOP nomination for president. After talking for 30 minutes about the need to keep Republicans in office, Mr. Steele ended by saying, "It's not over until the last vote is counted." I was happy to see Mr. Frost, a GOP volunteer who was busy as one of the "sign guys" when I became involved nine years ago. Mr. Frost is about to turn 91. He and his wife contributed much over the years. He was a cowboy from Montana who moved east years ago ... I enjoyed hearing his stories over the years and miss him now that poor health has limited his involvement. He was all smiles as usual ... and I asked to get a photo of him, Mrs. Frost, and "Jar Dog." Jar Dog is in the Marine Reserve, someone I met during the Bush 2000 campaign and who has been on my email list all these years. It was great to see him ... one of our heroes who has served in Iraq and who protects our freedoms and keeps us safe. There's a brand new conservative SWAC blogger in town ... Fishersville, to be exact ... and he's posting at Fishersville Mike. Pop on over and check out what he has written under his banner which proclaimes, "Another member of the Vast Right-Wing Conspiracy. It's vast, right?" Today in Israel a gentleman passed away at the age of 105 ... and his connection to the blogosphere was through his grandson and my ODBA friend, Ron, who blogs at Isophorone. I got some sad news that my last living grandparent died today. He was 105 and lived in Jerusalem. My grandfather was born in Salonika, Greece, in 1903 and immigrated to what is now Israel in 1913. (At that time the area was still ruled by the Ottoman Empire.) He was a tailor by trade and mended clothes well into his old age. He was deeply religious and prayed daily, even as a centenarian. Ron continues his tribute over at Isophorone. He ends by asking that a prayer be said for his grandfather. 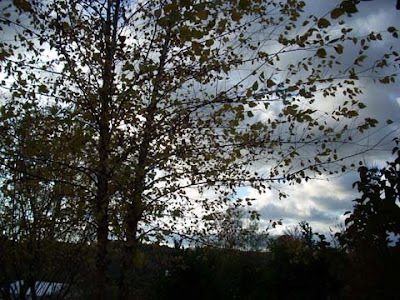 Here's a prayer for Ovadiah ben Avraham v'Simha ... and for Ron and his family as they now prepare to live life without him. May God bless. 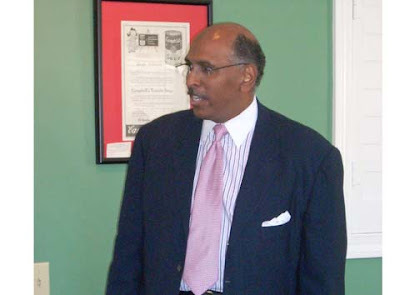 Just received confirmation that Michael Steele, former Maryland Republican Lt. 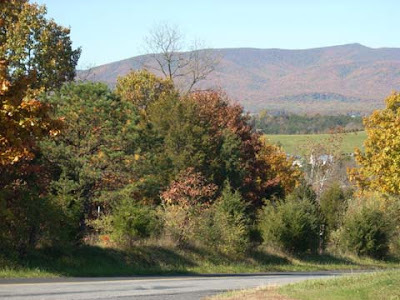 Governor, will be at Rowe's Restaurant in Staunton today at 1:45 p.m. along with Congressman Bob Goodlatte. 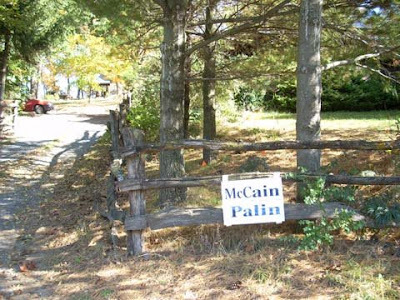 They will be stumping for John McCain for President in these final days leading to November 4th. The public is invited to come out and show their support behind our Republican candidates. Shad Plank is reporting UVA's Larry Sabato's election night prediction: Obama 364, McCain 174. Ouch. "Pastors & Patriots: Voting Our Values"
It’s decision time in America as we go to the polls next Tuesday. We share the deep concerns expressed recently by Dr. James Dobson, Founder and Chairman of Focus on the Family, about the Biblical and moral issues at stake in this election, and about the future of America. So, what are those key issues, and why are they so important? What is a pastor’s role during this election season? How do we decide who is best qualified to lead our nation? Who does Dr. Dobson support? And why does it matter anyway? Our subject this week is “Pastors and Patriots: Voting Our Values on Nov. 4”. This is the sixth and final program in our pre-election series, and we’ll be asking Pastors Jim Harrison and John Sloop to help us sort through the Biblical issues at stake in this election and where each of the presidential candidates stands on these key issues. I value the spiritual and moral discernment of both of these pastors, as I do the others who have spoken out on these pre-election programs. Therefore, I will ask them for their personal views about which of the two presidential candidates they believe is more strongly committed to promoting these key Biblical values. 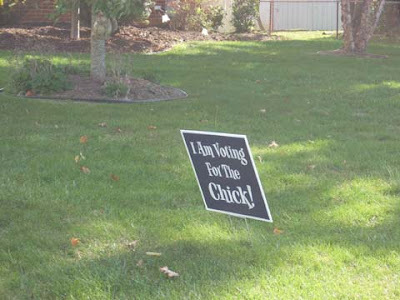 We’ll also report on which of the two candidates Dr. Dobson supports. 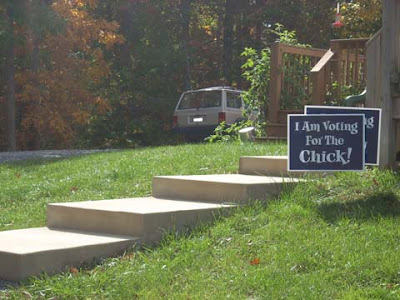 Note: In addition to their comments, you can also go to several excellent, non-partisan voter guides like David Barton's Wallbuilders and AFA.net for a clear comparison of where the candidates stand on a range of “values” issues. These guides are also approved for distribution in churches and other tax-exempt organizations, so please ask your pastor or priest if they can be distributed in your church on Sunday. 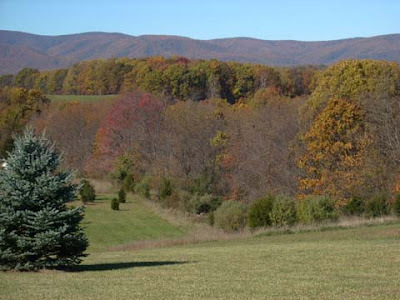 “Valley Faith in Action” airs at 8:00 p.m. Friday on WAZT-TV, which is Comcast Cable Channel 14 in the Harrisonburg area (the channel may be different in your area). It will air again on Sunday at 8:30 p.m., Monday at 8:30 a.m., and Tuesday at midnight. 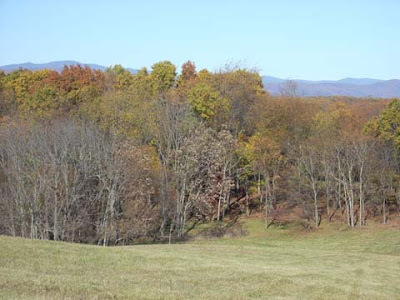 If you would like to help support this program, you can send a tax-deductible gift to the Valley Family Forum at 3465 Izaak Walton Dr., Harrisonburg, 22801. We would also welcome any comments you would like to share with other viewers. Together, we can make a difference, so please remember to vote your Biblical values on Nov. 4! McDonnell: "Vote Gilmore for America's security"
Although America’s national security isn’t the number one issue in the headlines right now, it is a topic paramount to the future of our children and grandchildren. Who we elect to the United States Senate from Virginia is going to help determine which direction our nation takes to defend America’s national interests around the world and at home. Because of his experience and his principles, I strongly recommend Jim Gilmore for the United States Senate. Jim and I are both Army Veterans, and as you can imagine, I have a deep appreciation for the service of the men and women of our armed forces. Jim Gilmore volunteered for the U.S. Army and played an important role in counter-intelligence for the U.S. Army, safeguarding the security of American bases in Europe. As you may know, Congress chose Virginia’s Jim Gilmore to chair a national commission charged with making recommendations on methods to prevent and respond to terrorist attacks on the United States. The Gilmore Commission warned in 1999 and in 2000 that America was facing a possible terrorist attack. After 9/11 Congress adopted 146 of the Gilmore Commission’s 164 recommendations. Jim Gilmore has the experience in homeland security I know must be possessed by Virginia’s next United States Senator. Virginia and our nation must elect Jim Gilmore to the U.S. Senate. Join me in the fight to elect JIM GILMORE as our next U.S. SENATOR. With less than a week to go you can help in this critical effort with your contribution...no matter how large or how small...by clicking the CONTRIBUTION link below. Also remember to VOTE on TUESDAY, NOVEMBER 4th for JIM GILMORE FOR SENATE. 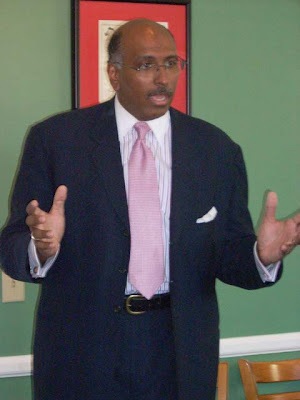 Michael Steele, former Maryland Republican Lt. 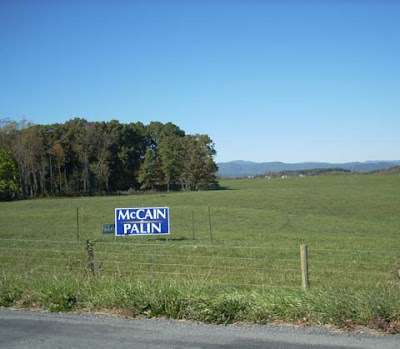 Governor, makes a stop today in Harrisonburg at Noon to stump for John McCain. He will be at the GOP Victory Center located behind Valley Mall. 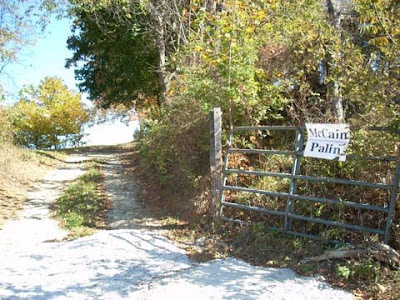 Homemade McCain-Palin sign ... GOP HQs could not keep signs in due to high demand so these folks made their own in Riverheads District. VA state police investigate dual voter registrations? Southside Conservative at The Contemporary Conservative has a breaking news story that the Virginia state police have been called in by the State Board of Elections to investigate possible student registration voter fraud. Check this news story from the PilotOnline.com. 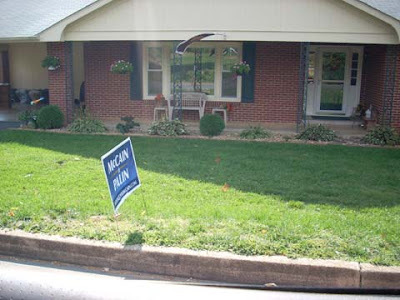 John McCain's 96-year-old mom, Roberta, is on the stump for her son and will be in Harrisonburg this afternoon at 4:00 at the GOP Victory Center. 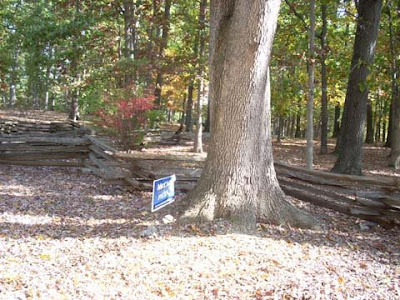 It is billed as a "Virginia Victory and Volunteer Appreciation Rally." Augusta Water Cooler, welcome to BNN! A new blog is in town ... well, actually it's been around for three or four months and is written by the newest SWAC blogger, Jason Bibeau. 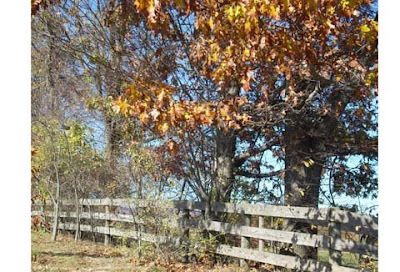 The Augusta Water Cooler began aggregating through Blog Net News/Virginia Tuesday which is a good thing because now it can be read by a wider audience. Jason bills his blog as, "A great place for conservative opinions, thoughts, and occasional blunt reality." For rational, well though-out political discussion, he is one of the best to go to. His stories have included Was that lobster gold-plated?, Sam Rasoul deceives NRA voters with Waynesboro sign, Wrong again, Senator Obama, and other great reads. 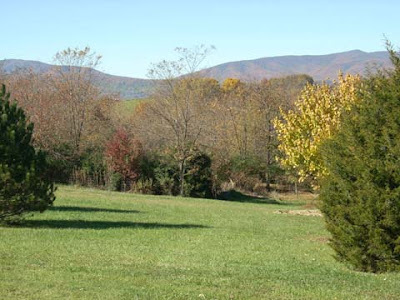 Welcome to the Virginia political blogosphere and BNN, Jason! 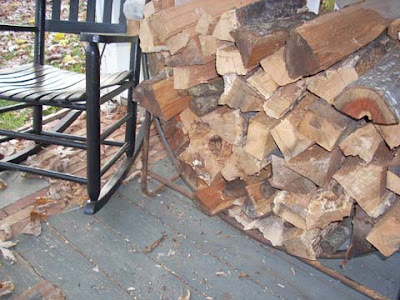 Firewood is stacked on the back porch as the woodstove cranks out heat on a wintry-feeling day. 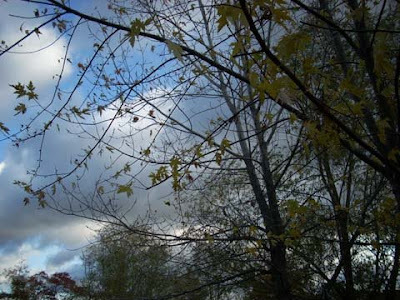 Dark clouds and brisk winds ushered in snow flurries, the first of the season in Augusta County. 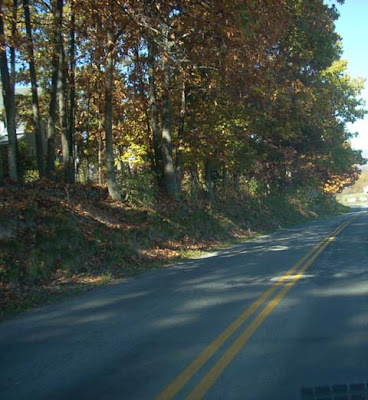 Highland County was expecting 2" of snow while flurries were to continue in Augusta through the night. 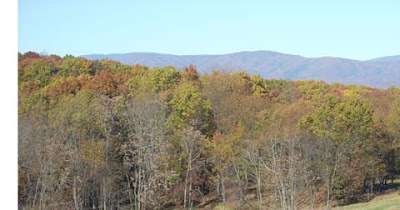 There is still plenty of color in the Valley as leaves continue their color show. Reagan: "How do you tell a communist?" Has Kaine used unethical practices with SBE? NRA Sign: "I'm a bitter gun owner, and I vote"
"You cannot help the poor by destroying the rich"
Sarah Palin to be in Roanoke Monday! "I'm a bitter gun owner ... and I vote"
What was Joe Biden talking about? "Why I Can't Vote for Obama"
Americans For Prosperity rocked D.C.! Actress Janine Turner part of Team Sarah!